We all have a piece of furniture or two that we don’t use exactly as intended. A chair used as a table, a quilt rack used as a drying rack, a linen cabinet used as a bookshelf…these are just a few of the ways we all modify our belongings to fit our needs. 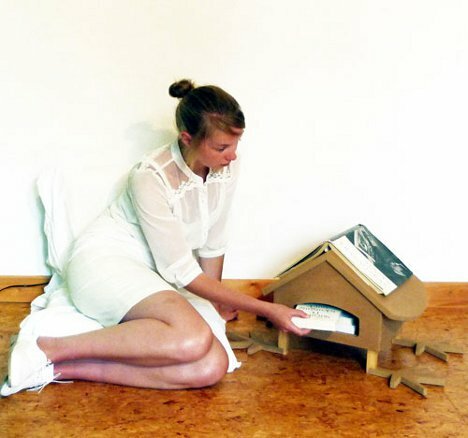 Belgian design student Fleur Sabbe observed how people used their home objects in unconventional ways and decided to make purpose-built items to fill those needs. 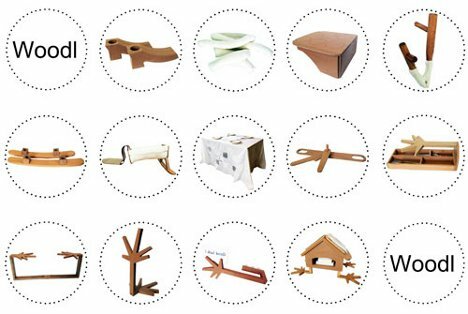 Her project, Woodl, consists of a series of fun and functional objects that make life easier by making simple additions to your existing furniture. 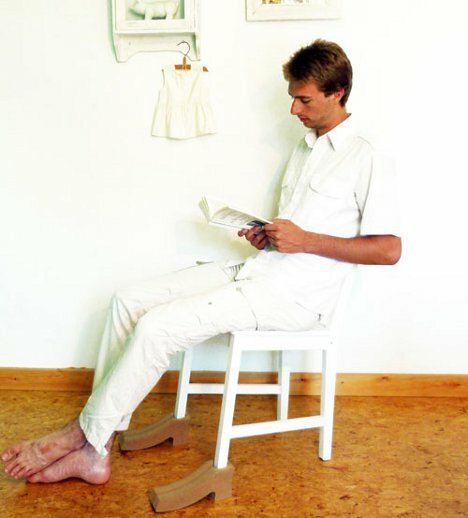 Above, the object called Lean Back adds a pair of wooden shoes to any chair to let you lean back without the fear of falling. Hang On is much like the bedside valets some homes still employ to keep things off of the floor in the bedroom. The piece attaches to a chair to add a couple of hooks to its back, letting visitors hand purses, coats and hats neatly off of the ground or sofa. Secret is a cutlery holder that hangs down beneath the table, with a flat wooden hand above. The little compartment keeps silverware out of sight but close at hand, a very useful object indeed for homes with a lack of kitchen drawer space. For book lovers, the Lay On is a sweet little house that helps organize your reading. The slot in front holds a small number of books, while in-progress books can be laid out on the sloped top to save your place. The adorably quirky object looks a lot like an obedient pet just waiting to help you enjoy your leisure time. Less practical than the other objects but just as endearing, the Footsie is a sort of swiveling pedestal for feet. It fits under a table so that you and your sweetheart can exchange some affectionate foot nudges during a shared meal. The Hang Down preserves your precious tabletop space by taking magazines and paperback books off of coffee tables and suspending them below. Sabbe’s signature wooden hands form the top of the device; the bottom, which fits under the table, is a simple wooden dowel. 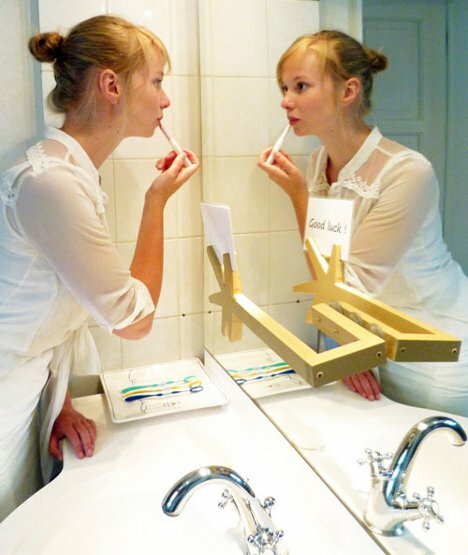 Using strong suction cups and lightweight material, the Message allows you to leave messages for your beloved in the bathroom mirror…which would require you to write your note backwards. We imagine the arm could also be used to hold very lightweight items like necklaces. For those times when you just need to feel a nice, strong embrace, Hug wraps its cozy textile arms around you to make you feel safe and protected. Side is a clever little object that fits a sort of shelf over the back of a wooden chair. The shelf can then be used for holding a drink, supporting a piece of paper while you write, or even for holding up your head for a quick nap. A rocking chair attached to a bassinet is the concept behind Rocking, an object that lets parents soothe babies while also enjoying a gentle back-and-forth rocking motion. The Stop is a simple doorstop that holds doors open with a whimsical hand shape. The object can even be used as a bookend, bringing full circle the entire concept of using home objects for unconventional purposes.